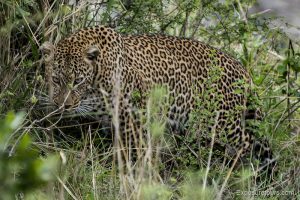 When it comes to the Big Five, Leopards (Panthera pardus) are amongst the most difficult to photograph. 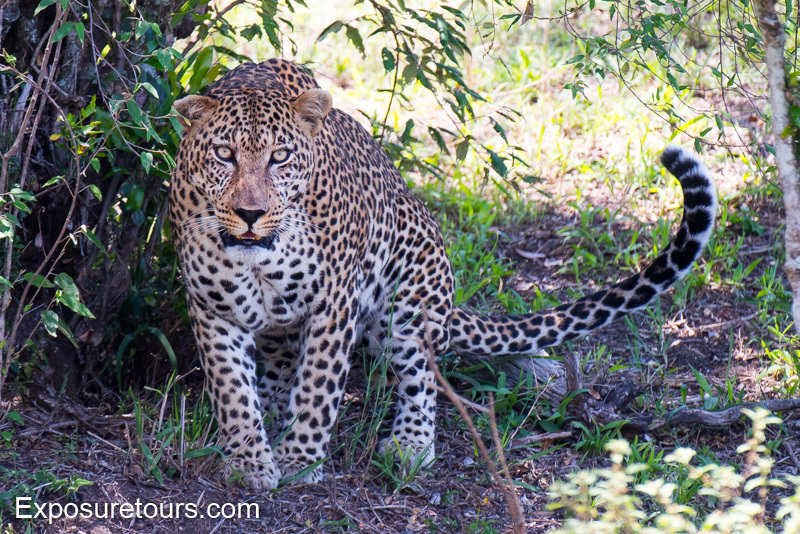 During the day with some hunting you can be lucky and find them resting in the bush or up in a tree. On a few rare occasions the conditions have been ideal and I’ve come across them walking in the open or looking for small prey on the ground. 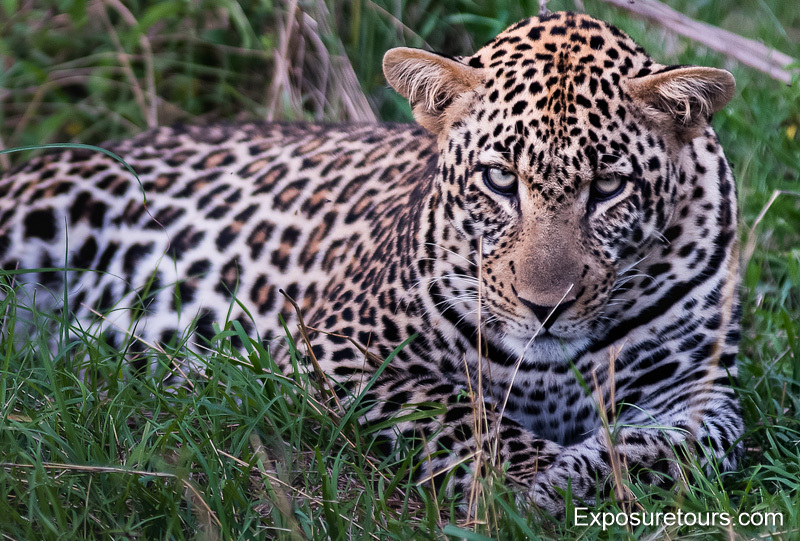 Leopards tend to be most active from dusk to dawn so getting a kill shot is almost impossible. This image has been taken in almost total darkness. I had to switch the camera to manual focus and bump the iso to 20,000! 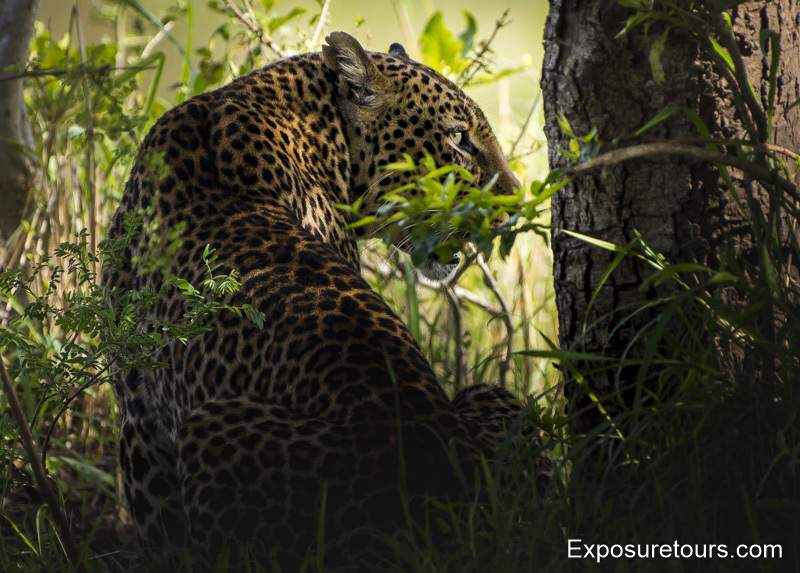 Without the sensitive chip of digital camera it would be impossible to see the leopard with the naked eye. 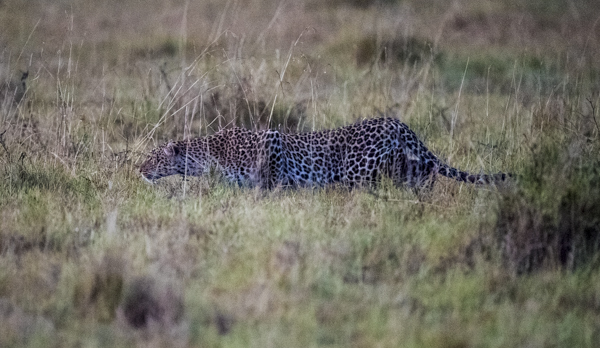 Watching it move slowly in the grass as it tracked a group of wildebeests was an amazing unique safari experience. Their style of hunting is different from most cats. 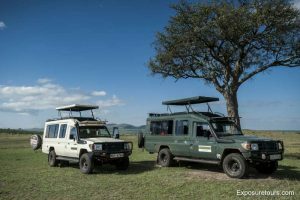 Lions typically hunt in groups by stalking their prey, slowly surrounding them and working together to isolate a weaker member of the herd, pouncing as the animal tries to escape. 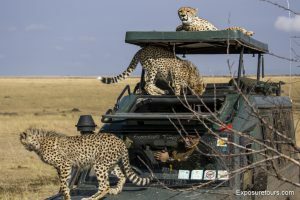 Cheetahs use speed as their primary weapon. 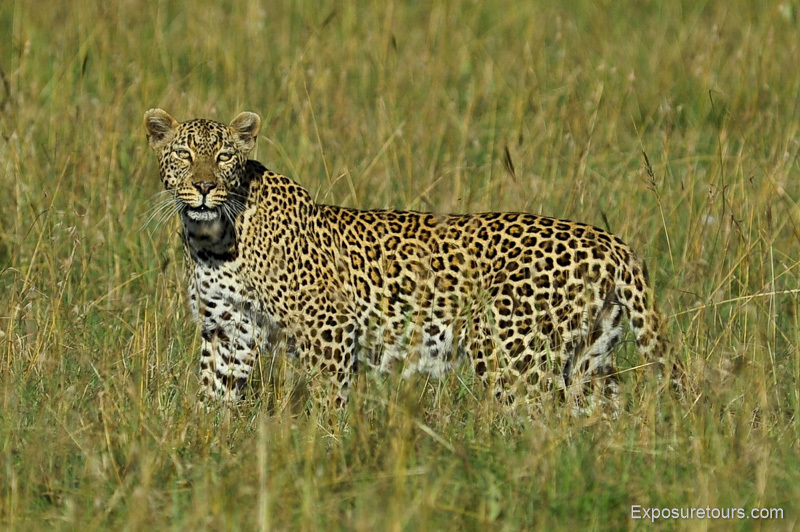 Leopards rely on stealth to get close to prey (mostly antelopes, deer and rodent) They move with their whole body less than an inch from the ground maintaining a low profile. When they are within 16 ft. They pounce and use their powerful jaws to bring down the kill. They are capable of taking down animals as heavy as 150kg compared to their own average weight of 10-40kg. Small kills get eaten right away, large animals get dragged to a safer location and hauled up as high as 19ft into a tree. 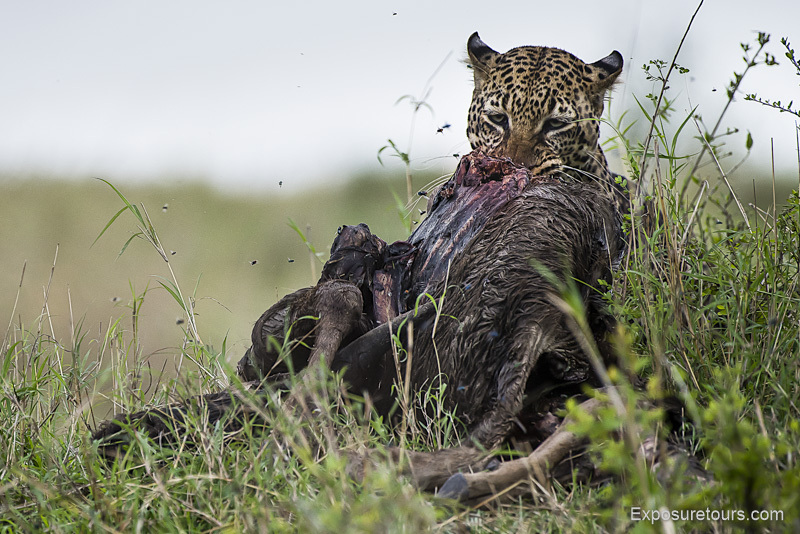 The leopard will feast on the kill over several days or even a week. Surprisingly the kill doesn’t smell as much as you would expect. 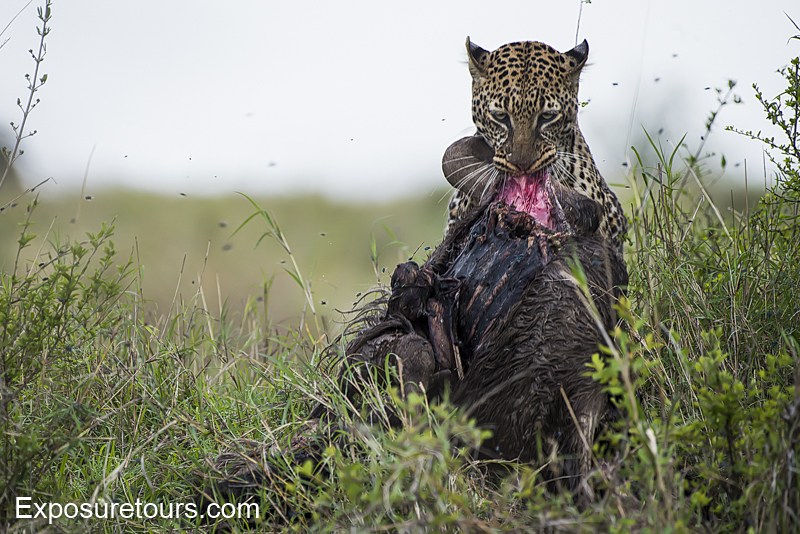 Having the carcass hanging means that the blood can drain and the meat spoils at a slower rate. There really is no standard time for how long you have to wait for a good image. The next day I went back to the same area and immediately captured the close up shot of a female in a tree that you can see at the base of this post. 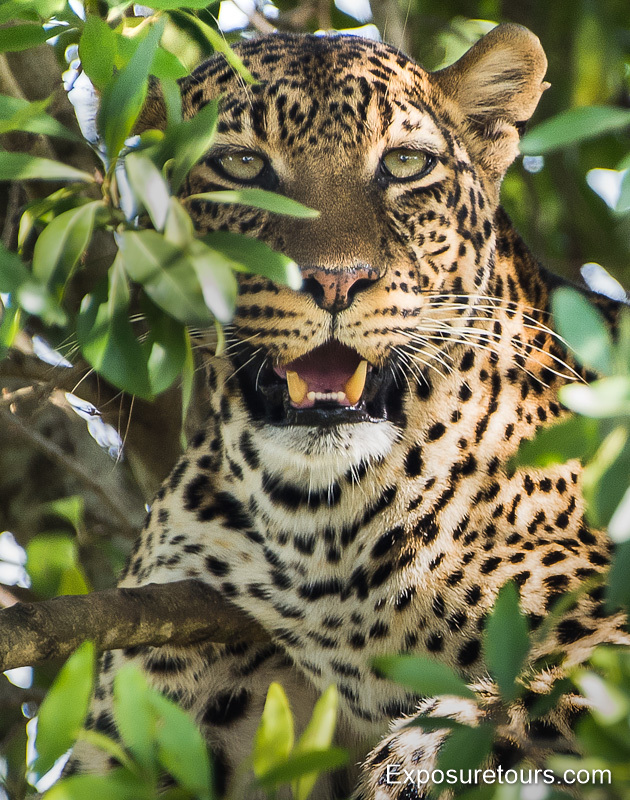 I spent around an hour watching her so I could get a clear image and avoid as much foliage as possible. 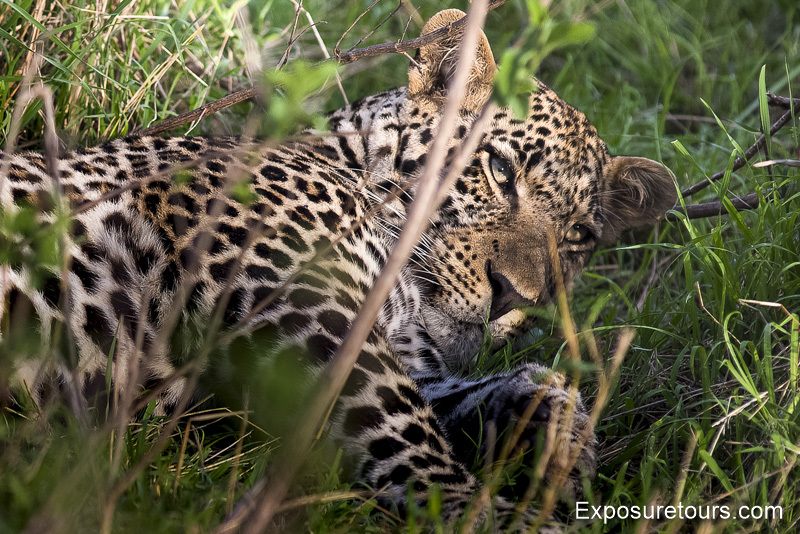 Seeing a leopard with a cub is another rare experience. Their litter is normally 2-4 cubs with only 50% surviving past the first year. 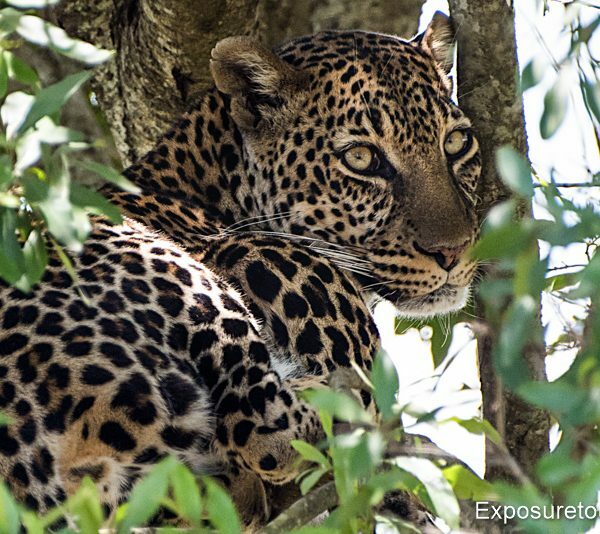 The mother leopard will often hide the cubs in thick bush away from predators and humans making a mother and cub shot an image I’m still working on capturing! 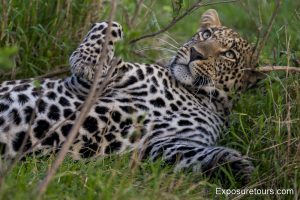 Want to get your own Leopard Pictures?